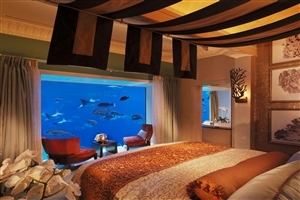 The Legend of Atlantis is brought to life in modern day Dubai at this iconic resort. 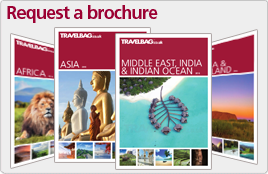 Situated on its own man made island, the resort’s architecture is instantly recognisable. 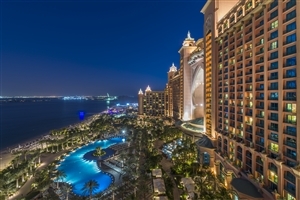 Arguably Dubai’s most renowned 5 star hotel, Atlantis the Palm holidays are synonymous with opulence and elegance. Each room in the Atlantis, the Palm has been designed with the utmost attention to detail, as subtle ocean themes are combined with Arabic influences and unapologetic comfort to create the dream hotel room. 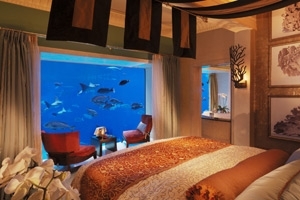 The hotel’s underwater suites are just incredible, offering guests a surreal and unique experience. 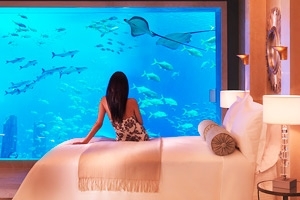 Where else can you sink into your bed while looking right out into an aquarium filled with 65,000 marine creatures? 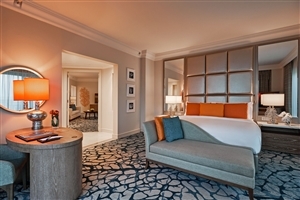 Once you have wrestled yourself away from the room you can experience any of the 23 world-class restaurants, bars and lounges on offer at the Atlantis the Palm hotel. With 28 different cuisines on offer you are sure to find the food your taste buds truly desire, be it Japanese cuisine or the ever-popular, simple but satisfying steak. 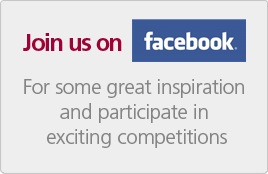 There is something here for everyone. If it’s thrills and adrenaline you’re looking for on holiday, then look no further than the Aquaventure Water Park. 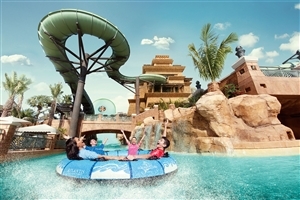 Completely free to all guests of Atlantis the Palm, Aquaventure boasts some of the best water rides in the world. After Aquaventure you can carry on the aquatic theme by taking a swim in Dolphin Bay, meeting the sea lions at Sea Lion Point or visiting The Lost Chambers Aquarium where you can explore the mysterious ruins of Atlantis. 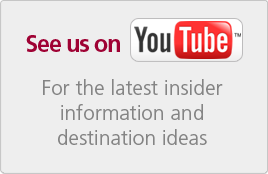 There is no shortage of entertainment here, whatever your age! 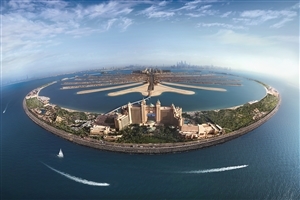 Atlantis the Palm sits on its own man-made island in Dubai. One of the most elegant hotels in the world, the recognisable design arches beautifully into a typically clear blue Arabian sky. 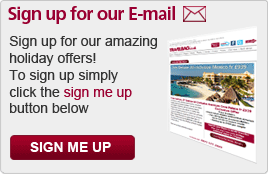 The astounding variety of things to do on the resort makes Atlantis the Palm a holidaymaker’s playground, whether it’s a family holiday or a romantic escape for two. Adults and kids alike will be wowed by the majesty of the 65,000 marine animals contained within The Lost Chambers Aquarium. If you’d rather get a little closer to marine wildlife, you can swim with playful dolphins in Dolphin Bay. The thrillseekers amongst you will be tempted by the tantalisingly terrifying Towers of Poseidon and Neptune in the Aquaventure Water Park. The Zero Entry Pool provides the ideal thrilling environment for families while the Royal Pool offers a tranquil environment with beautiful views of the Dubai skyline. The all-new Wavehouse invites all travellers to experience a world of excitement which combines dining, entertainment and nightlife. Alongside this, why not drop the kids off for a fun-filled day at Kids’ Club while you retire to the ShuiQi for some world-class pampering? In the evening, the Atlantis the Palm comes to life, with 23 exceptional restaurants, bars and lounges serving 28 different cuisines. 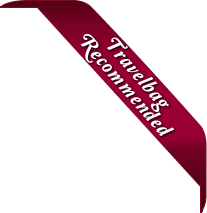 So whatever tickles your tastebuds, you’ll find it on this indulgent 5 star resort. And if you don’t want to retire to your room too early, then get ready for a night of partying. World-renowned DJs like David Guetta have played at the clubs of Atlantis, the Palm. 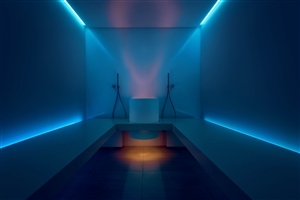 The nightlight on this resort will make a late night well worthwhile. 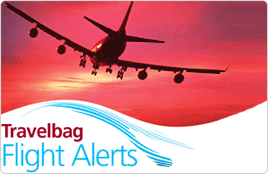 So whatever you’re looking to get out your break, a holiday at Atlantis the Palm can meet your needs. 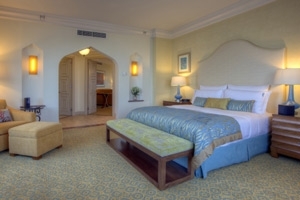 The Deluxe room boasts partial views of the Arabian Sea or The Palm Island. Each Deluxe room has a balcony and a spacious bathroom with a walk-in shower, separate bath and complimentary bath products. You can either choose a king size or two queen size beds. 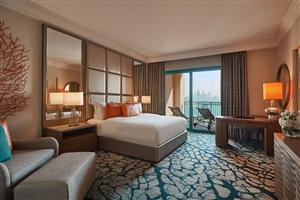 The Ocean Deluxe Room at Atlantis the Palm is perfect for those seeking holiday accommodation with beautiful views of the Arabian Sea, and stunning sunsets. 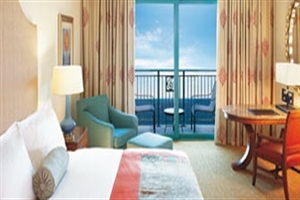 Each Ocean Deluxe room comes with a balcony, a spacious bathroom with a walk-in shower, a separate bath with complimentary bath products and a choice of king or two queen beds. 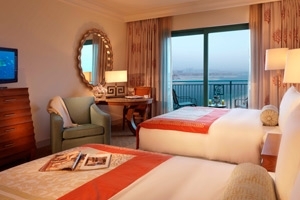 The most popular room, the Palm Beach Deluxe room comes with unique views of pristine coastline and Dubai city skyline. Each luxury room comes with its own balcony, spacious bathroom with walk in shower, separate bath and complimentary bath products. 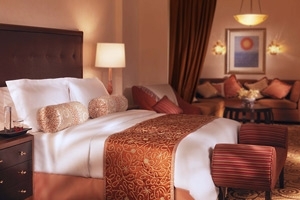 This is a popular choice of room for those on holiday at Atlantis the Palm. Perfect for those who desire a little extra luxury, the Imperial Club room has exclusive access to the hotel’s Club Lounge and private Imperial Club Beach, which feature complimentary full hot breakfasts, all day snacks and afternoon tea or pre-dinner drinks/canapés. 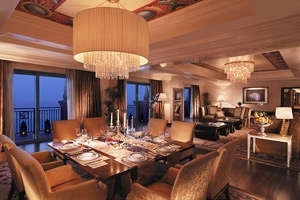 The Terrace Club Suite is a luxury suite perfect for those looking to explore a little. 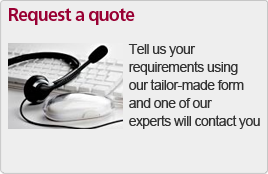 Its location makes surrounding areas a little easier to reach. This superb suite comes with large balconies complete with sun loungers and a dining table. This means guests can dine in total privacy on their holiday here. Each suite includes a living room, bedroom, dining table and a work desk for those on business trips. The bathroom features a walk in shower and separate freestanding, oval bath. 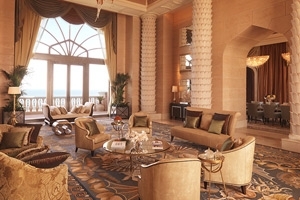 The Exclusive Club Suite at Atlantis the Palm has been described as the perfect balance between space and comfort. 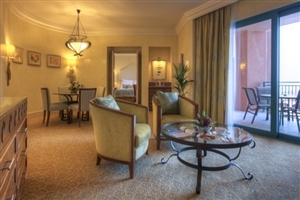 This suite brings you luxurious fabric in Arabian colours and a living room with lavish and comfortable furnishings. The suite comes with a balcony so its guests can enjoy Arabian sea views as well as spectacular views of the iconic Dubai skyline. 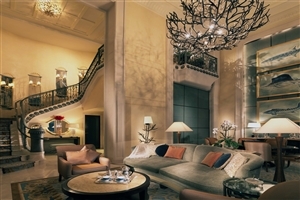 This is an excellent choice for those seeking a luxury holiday at Atlantis the Palm. This superb suite is much larger than the other available suites, boasting bigger balconies with views of the Palm, Dubai skyline and the glistening Arabian Sea. Decorated with the most beautiful luxurious fabrics in Arabian colours, the Atlantis the Palm’s Regal Club Suite looks to bring its guests an authentic taste of the Emirates. 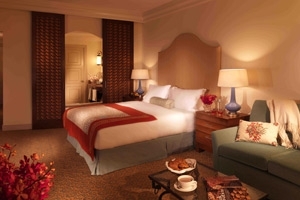 An added bonus is that this suite is also available as a 2-bedroom suite at your request. Ossiano -The Ossiano is a restaurant of special magnificence due to the mesmerising aquarium that makes up its walls. An apt accompaniment to the exquisite seafood that you will find on your plate in this fantastic Seafood Restaurant. 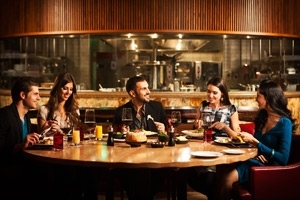 Nobu -Nobu is a world-renowned Japanese restaurant created by the ingenious Chef Nobu Matsuhina. His unique combination of traditional Japanese cuisine with South American influences is sure to create a memorable dining experience. Yuan -Yuan will bring you all the tastes of China. You will be seated in an Oriental Inner Courtyard which has been designed using Chinese ideas of harmony and balance or in the Principal House in which you will dine surrounded by beautiful scenes of nature reminiscent of the halls of Chinese nobility. 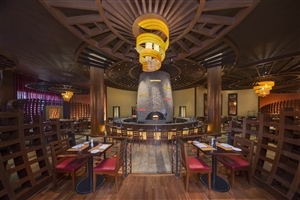 Seafire Steakhouse and Bar -Seafire Steakhouse and Bar sources the finest cuts of beef from around the world, grills them over flaming charcoal and then serves them up for your dining pleasure. Sometimes, only a steak will do! 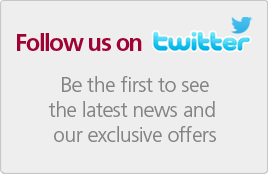 Levantine -Levantine offers its guests the opportunity to sample the beautiful cuisine of the Arabian Peninsula. This Lebanese restaurant brings you classic mezzeh, seafood and meat grills. Make sure you get yourself onto the Levantine Bar and Terrace which is open until 2am and provides magnificent views of the Dubai skyline. Kaleidoscope -Enjoy the distinguished flavours of Arabic, Mediterranean and Indian influenced dishes at this international, all-day buffet restaurant where live cooking stations and perfectly prepared cuisines are sure to entice the most discerning of palates. Wavehouse -A new, revolutionary venue that brings dining, entertainment and nightlife to a whole new level. Part beach bar part gastropub, the Wavehouse eatery will combine the very best in family-friendly fun with adult downtime while looking out over the Aquaventure Waterpark. 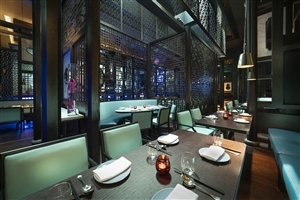 Hakkasan -An award-winning restaurant that serves some of the most exquisite, authentic Cantonese dishes made from the freshest combination of ingredients and spices. 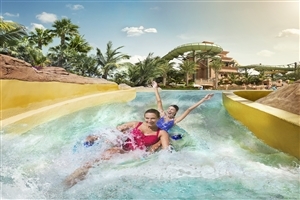 Aquaventure Waterpark - free for all guests, this waterpark has some of the most thrilling rides in the world. Not for the fainthearted. Dolphin Bay offers guests at Atlantis the Palm the opportunity to swim with majestic, playful dolphins. 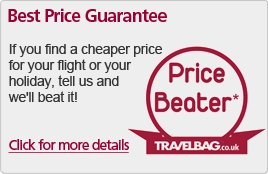 A truly once in a lifetime experience! An on site gym for fitness fanatics. Being on holiday at Atlantis the Palm doesn’t mean you have to let your fitness routine go. The on site gym is state of the art. Scuba diving with instructors on site. Enjoy the marine line up close.